← Is it getting warm in here? We bid a fond farewell to the stuffed-bunny-zombie and super-hero hijinks of the last few sessions, and embark today on a brand new adventure. This time, we're going ... ABOVE THE WAVES! Even after decades, the dreaded pirate known only as Kurtz still terrorizes travelers on the southern sea. An unknown for most of his life, Kurtz exploded onto the scene when he turned to a life of murder. Using a modified military-grade aircraft, Kurtz has robbed and killed thousands. Though pirates have always been common, Kurtz's daring and brutality sets him apart from the multitude. Unlike other bandits, who rely on sheer force of numbers, Kurtz flies only with a small band of devoted followers. Thanks to this limited membership, along with the fact that he only attacks at night, Kurtz has evaded capture. The world has chugged along despite his efforts, but Kurtz remains a very real threat. The blood he's spilt could stain the very ocean, and more lives are claimed every month. Even as his death toll rises, many search for Kurtz. Whether for bounty, justice, or fame, these brave souls search for a true demon. The Debtor - You have never shied from a challenge nor let an opportunity slip by. As a result of your drive, you have taken loans from some less than reputable characters. If you could only make one big score, those debts would disappear. The Vendetta - Your pride has earned you some powerful enemies. Maybe once you have earned the respect of the world these grudges will be forgiven. The Wanderer - You have drifted for most of your life. Only travel can soothe your restless heart. The world may be your oyster, but at the moment you haven't a penny to your name. Quick, simple, easy, just the way I was in high school. What could be better?! This entry was posted in Above the Waves, RPG Corner. Bookmark the permalink. 12 Responses to A new adventure! I wonder if Jeffrey Rush got any royalties for that cover? I took The Debtor, because it was the lowest on the list. Also, if it worked (highly unlikely), it would make me feel more Han Solo-ish. Is the guy on the cover supposed to be our villian, Kurtz Kobainz? Tortuga. I’m still in Tortuga. So, what era is this? The picture makes it look like a classic swashbuckling pirate deal. But the description drops “military-grade aircraft” like it’s no big deal. As for character… Well, none of them are terribly inspiring. I’m voting for “owes the mob money” over “someone hates you” or “have nothing better to do”, as it sounds slightly more interesting. I made up the cover based on their regular books. I thought it was going to be a pirate adventure. Oops! It took me a second, but once I realized what you were quoting, I got a good laugh. Nice reference! I’m going with the Debtor. He’s got drive, bravery/foolhardiness and seizes opportunity. Powerful types have an interest in keeping him alive, for whatever that might be worth. I think this wins out over pride and restlessness. 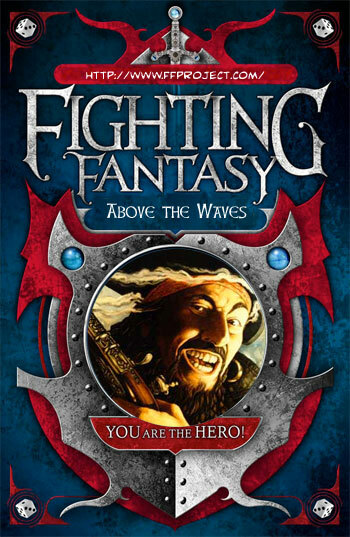 I used to love the Fighting Fantasy books as a kid, gonna enjoy this!!! So, this is not a pirate adventure? ?